This beautiful 3300+ square foot villa is absolutely breathtaking. 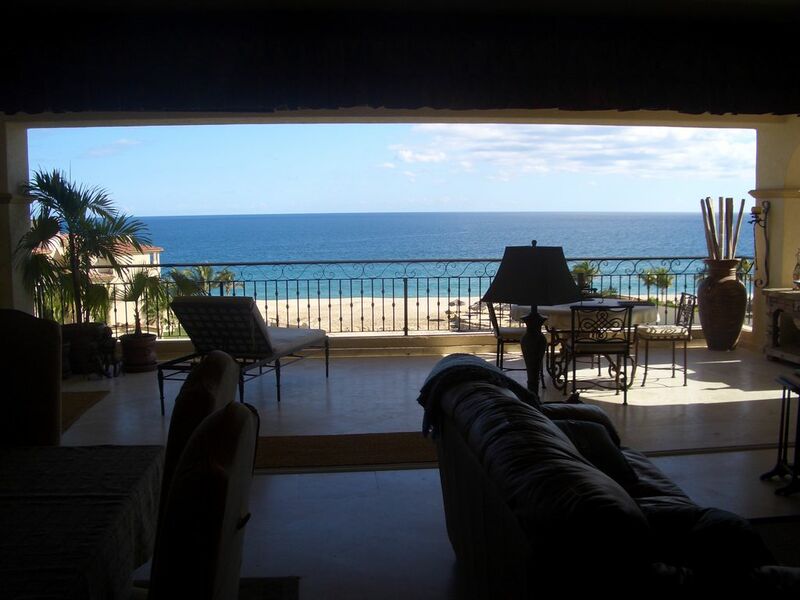 Located on the fifth floor of an oceanfront building in Las Mananitas, the first thing you see when you step in the front door is a panoramic view of the ocean through a sliding glass door that spans the length of the dining and family room. This door folds into the walls giving you a soft ocean breeze throughout the day. The balcony extends the entire width of the condo with direct access from each bedroom and the family room. This condo has 3 bedrooms, 2-Master bedrooms with private bathrooms, jetted tubs, walk-in closets, TV's with satellite to US channels, and king beds. The 3rd bedroom has 2 double beds, a TV and dvd player, and is located directly across the hall from the main bath. The unit also includes a private laundry room, water purifier, zoned, air conditioning, a blow up queen mattress, a play-pen crib, plus more. Professionally decorated, this unit is absoutely beautiful. About 20 minutes from the airport on toll road, getting here couldn't be any easier. There are onsite concierge, maid, and spa services. There are three swimming areas containing huge pools and hot tubs available to the guests at Las Mananitas. One of the pools being a salt water pool. Just a couple minute walk to the nearby Mega store and shopping area, it is easy to run over and grab something to fill up the refridgerator with. The restaurants in San Jose are fantastic, make sure you try out Morgans. If you would rather stay in and cook there is a Costco about 25 minutes away. We live in Washington state near our 8 grown up and married children and 32 grandchildren who all love and serve the Lord. February, 2011 will be our 46th wedding anniversary which we plan to celebrate in Mexico. We love it in Baja Mexico because you are almost guaranteed perfect weather. We have been going there about 4 times a year since 2004 for one to three weeks at a time and have only had one trip that we had any rain at all and that time we had showers two days. Every morning there you wake up to a beautiful sunrise and warm weather. The local people are very friendly and helpful if you need anything. The food there is excellent and very reasonable. We love to wake up to a beautiful sunrise and walk or jog the beach, play tennis, or set on the deck overlooking the pools and ocean where we often see whales and other fish. We enjoy the quiet town of San Jose where there is excellant food and restaurants whereas if you prefer the nightlife it is only 25 minutes to Cabo San Lucas. Walking distance to shopping and fine dining in San Jose Del Cabo. From our 5th floor deck you overlook the swimming pools and the beach and can see whales blowing in the ocean and boats cruising in the water. 24 foot wide patio doors open onto full width and 10 foot deep balcony overlooking swimming pools, hot tub, barbecue grills, and direct view of ocean. Mini golf on site, 9 hole community course walking distance, many beautiful 18 hole courses close by, all with breath taking views. The weather in San Jose is the best in the world with 350 days of sunshine. There are numerous Link style golf courses within five miles of the condo. Las Mananitas is a quiet resort where you can relax around the pool and always find a chair around the pool to take sun. Wonderful property in a wonderful location. As other reviewers have said, this place is amazing! It is better than the pictures. It is a quality condo in an excellent location. The complex's grounds were kept perfect. The staff at the complex were polite, courteous, and attentive. The view is amazing. We watched whales breaching on 2 days and could see them from the lanai on most days. The location is very good. We walked to the well-stocked grocery store at least once a day. The beach is nice right out front. Although the red flags were flying every day (a resident said in the 5 years they've lived there, it's always been red), the beach was calm with low shore breaks about half the time. It wasn't calm enough to paddle board (for us novices) at that beach until the last day. It's a large beach so plenty of room. Not really a swimming beach, but we drove to two other public beaches (Chileno and Santa Maria) that both had pretty good snorkeling, nice amenities, and lifeguards. The place is pretty big and absorbed our group of 4 adults and 4 kids (aged 6-8) well. The only real negative was that we had to leave at the end of the week. But we are all planning on a return trip. It was truly amazing! Most amazing condo with everything we could have asked for and more. We stayed as a family of four with a 9 year old and a 16 month old. The condo could not have been in a better location with the grocery store only a 5-10 minute walk away. We have never stayed in a VRBO that was this well stocked with everything we needed in the kitchen and also some beach toys for the kids. The condo was so much bigger than the photos even show and was in excellent condition, clean, and had the most amazing views. The amenities on site were awesome to keep the kids busy and we had the pools to ourselves almost the whole time. The swim beaches were not a very far drive and there was also a little kids park 5 minutes walking distance from us. We would recommend this place to anyone wanting a quiet stay. Perfect for a couple or for families. The host was also excellent in communication and getting back to us right away. Thanks for the lovely stay. Our family and our best friends stayed at this lovely, well appointed and spacious property. We cannot recommend it highly enough— from the incredible view and veranda, ability to open up the entire living area to the sea, best coffee maker ever, great swimming pools and pristine complex— absolutely no complaints! The owner was also great to work with. We loved our stay at Las Mananitas! This condo was so beautiful! The large patio was one of the best parts!! We got up early most mornings to watch the sunrise on the patio! We were walking distance to the grocery store and restaurants! Habaneros and Cynthia's were favorites! Lloyd, the condo owner, was very nice and easy to work with! Thank you for sharing your home with us! Hope to come back in a couple years! Loved it. Can Not wait to go back next year. My husband and I and another Washington couple stayed at Las Mananitas this February and everyday we woke up to the beautiful Sea of Cortez with plentiful whale sightings, views of the pools, blue skies and palm trees. What a stunning unit and so tastefully decorated. The rooms are large and the beds are so comfortable. My husband remarked many times that this was the most relaxing vacation ever!! Walks down the beach and sleeping to the sounds of the crashing waves were a treat. It really is funny seeing grown women giggling about "I can't believe we get to stay here!" Cannot think of anything extra we could hope for, except to stay for a month or so. So grateful to the owners to open their home away from home so we could enjoy. Mucho Gracias!! On-Site activity Center will book horse back riding, whale watching, ATV tours, fishing, and much more. Tennis court on site. To complete reservations a contract will be emailed to guests and will be required to be signed, returned, and payment made to complete reservations.